Technical Tip: Free testing available. A06B-0121-B075 or A06B-0121-B075#7000 Fanuc AC3/2000 Alpha AC Motor with Taper Shaft with a keyway and A64 Fanuc encoder. 3 Nm TRQ, 3 phase, Max 2000 RPM. 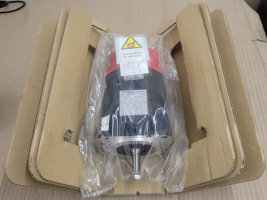 In Stock today for same day or next day delivery, This motor was fitted to small machines including colchester harrison lathes from the 600 group, Tsugami and Citizen lathes. We are not Affiliated with any FANUC CNC or FANUC UK or Fanuc CNC UK Ltd Companies.